EUR/USD is consolidating its losses amid a souring market mood. A light calendar leaves the focus on trade talks and the deteriorating prospects for the euro-zone. 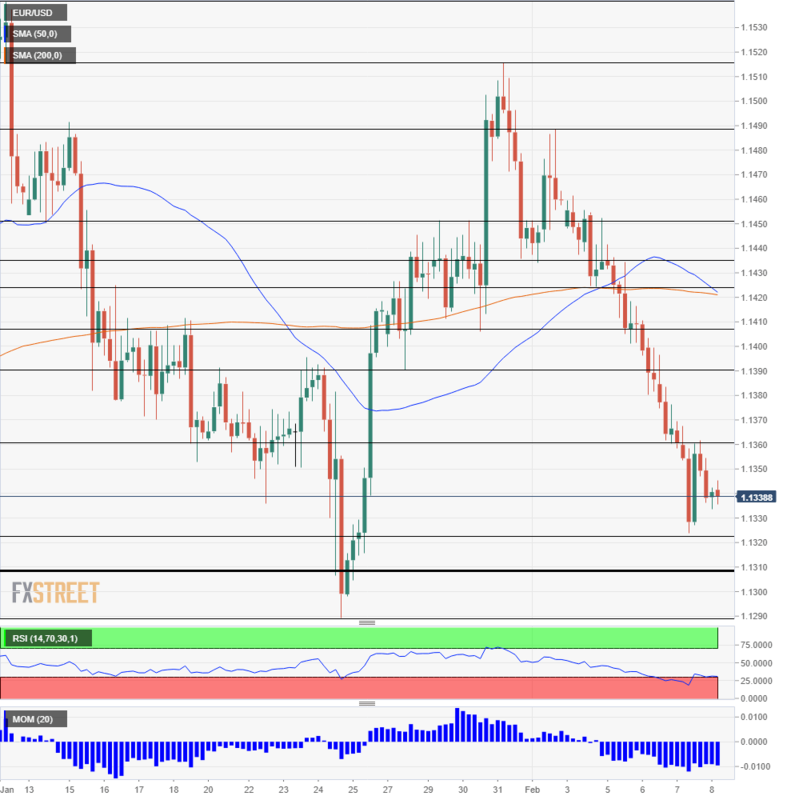 The four-hour chart shows EUR/USD is flirting with oversold conditions. Euro dollar is trading in the lower half of the 1.1300 handle after extending its losses. The latest disappointment came from developments around trade talks. US President Donald Trump said that he would unlikely meet his Chinese President Xi Jinping before March 1st, the deadline imposed by the US to conclude negotiations. The Administration is set to slap new tariffs on China if no accord is reached. Larry Kudlow, the President’s Economic Adviser, also said that negotiations have a long way to go. The result was a slide in stocks. The risk-off mood boosted the greenback and the safe-haven Japanese yen. In the old continent, the euro is still reeling from the European Commission’s growth forecasts. Brussels slashed the bloc’s outlook from 1.9% GDP growth in 2019 to only 1.3%. Germany is projected to see an expansion of only 1.1% and Italy a meager 0.2%. Economic indicators have not been favorable either. Germany suffered the third consecutive day of misses on its data. Seasonally adjusted trade balance slipped to 13.9 billion in December, worse than had been expected. However, there is a silver lining: both exports and imports increased. All in all, the economic downturn in the euro-zone outweighs solid growth in the US, despite the recent dovish twist by the Fed. The economic calendar lacks any top-tier indicators on both sides of the Atlantic, leaving speculation on the prospects of trade and euro-zone growth. EUR/USD suffers from downside Momentum on the four-hour chart. However, the Relative Strength Index (RSI) is just below 30, pointing to oversold conditions. The RSI implies that the pair will need some time before the next downwards move, or may bounce. Support awaits around 1.1320, which was Thursday’s low. Close by, 1.1310 was a double-bottom in December. It is followed by 1.1290, the 2019 low. 1.1270 is another double-bottom from late last year, and 1.1215 was the 2018 low. 1.1360 capped the pair early in the day and serves as the initial line of resistance. 1.1390 and 1.1405 were both swing lows in late January. 1.1425 was a temporary line of support in early February and is followed by closely by 1.1435 and 1.1450.